Not just Scotland's capital city and an important centre of the late 18th-century Enlightenment, Edinburgh is now one of the most popular tourist destinations in Europe - and in Britain, it’s second only to London. Its rich history is in evidence everywhere you look from the famous castle, towering above streets of genteel, granite grey houses - many of which have been converted into some of the best places to stay in Edinburgh - to the startling new and wildly over-budget Scottish Parliament building. 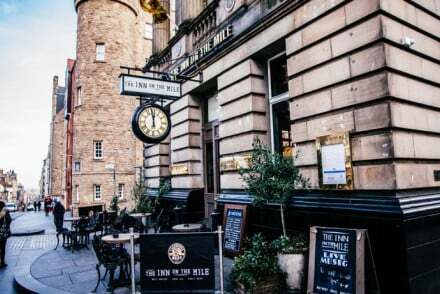 The Royal Mile is the best place to stay in Edinburgh if you’re not going to be here for long - or if you just want to be in the thick of the attractions, and we've picked the 5 Best Hotels on the Royal Mile (or Almost) to get you started. For a location with easy access to all of Edinburgh's historical highlights, the Old Town is where to stay, and we've picked the 5 Best Hotels in Edinburgh's Old Town to help get you started. The New Town has the beautiful Georgian architecture, plus the Portrait Gallery, some great boutiques and arguably the chicest cocktail bars. If this sounds like you check out our recommendations for the 10 Best Hotels in Edinburgh's New Town? The West End has a villagey feel and is crammed full of great bars and restaurants. It's also ideal if you want access to both the city centre and attractions like Murrayfield and the Zoo. 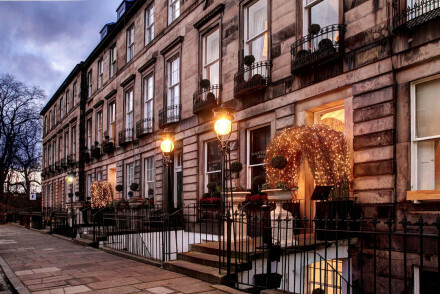 Consider staying in one of our recommended 6 Best Hotels in Edinburgh's West End. Leith was down-and-out but it’s now totally hip, and we have tips for the top 3 Best Hotels in Leith too. Edinburgh's International Arts Festival, held over three weeks every August when the population swells to double. If you can bear the crowds it's a fabulous time to visit, with venues crammed into the most unlikely locations and performances from street theatre to comedy to music (classical and popular) - there really is something for everyone! The Military Tattoo also takes place during the Festival with Edinburgh Castle as its backdrop. It's a fantastic display of military bands and cultural performances from across the globe. Climb Arthur's Seat. Situated opposite Holyrood Palace at the bottom of the Royal Mile, Arthur's Seat is a volcanic mound and Edinburgh's highest point. When you reach the top (it's not particularly hard work) you're rewarded with awesome views across the city and beyond. Edinburgh Castle with all its history, stunning crown jewels and wonderful views. Keen gardeners will love a stroll around Edinburgh's Royal Botanic Garden. Its 70 acres are a joy whatever the season. Edinburgh has an excellent range of museums, galleries, stylish shops, cafes, bars and restaurants. 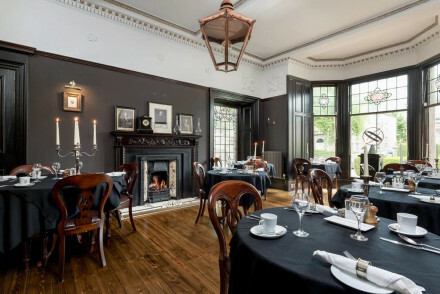 The Hotel Guru's selection of the best places to stay in Edinburgh covers all bases too from the opulent extravagance of Prestonfield to the B+B Edinburgh, a roomy property in the heart of the West End that feels more like a private club. For complete over the top decadence it'll have to be a night at the Witchery by the Castle - think gilded ceilings, panelling and swathes of jewel-coloured velvet. 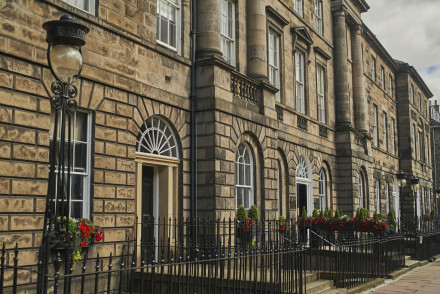 Six Brunton Place is a superb hotel which well captures all the splendour of Edinburgh’s Edwardian history. There are 22 plush rooms, all elegantly decorated and with fine artwork. You’re just to the east of the city, about 15minutes walk from the Royal Mile and the castle. 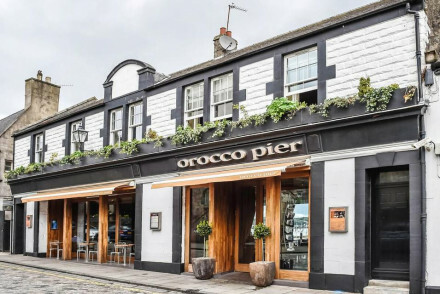 The Balmoral, Rocco Forte's outpost north of the border, with its chic interiors and Michelin starred dining, is quietly confident that it’s THE place to stay in Edinburgh. There are 168 rooms and a comprehensive spa as well as that restaurant. At the other end of Princes Street check in to The Rutland which offers twelve individually decorated bedrooms plus Edinburgh's first gourmet steak restaurant. You can’t get closer to the action than The Inn on The Mile, a nine room hotel and inn on the Royal Mile just five minutes stroll from the castle. Twelve Picardy Place is a ten room hotel converted from a beautiful Georgian townhouse. The decor is cool and contemporary and there’s a trendy cocktail bar and sleek steakhouse. 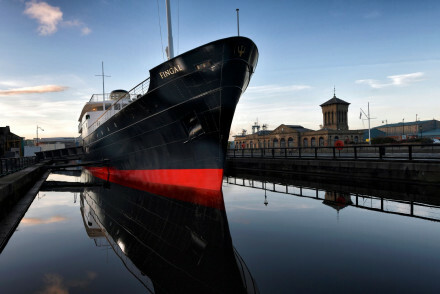 Malmaison Edinburgh occupies a former seaman’s mission in the heart of Leith. 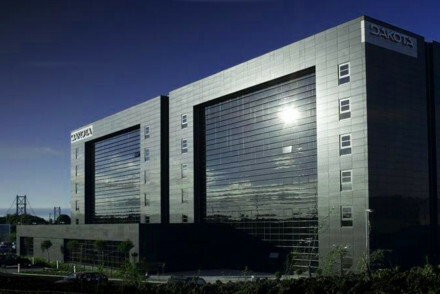 Expect all the Malmaison trademarks: a state of the art gym, restaurant, stylish bar and roil-top baths. Starting from around £85 per night. 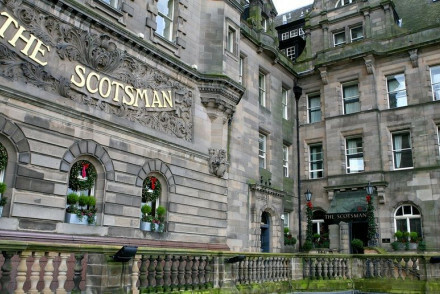 The Scotsman is good for being in the thick of things, and effortlessly blends old and new and has great facilities, including a top notch spa and 3AA Rosette standard brasserie. 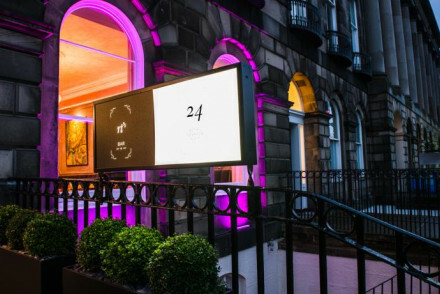 21212 is a Michelin-starred restaurant with four rooms just ten minutes from the Royal Mile and the castle. You’ll feel more like a guest at a posh house party than at a hotel. 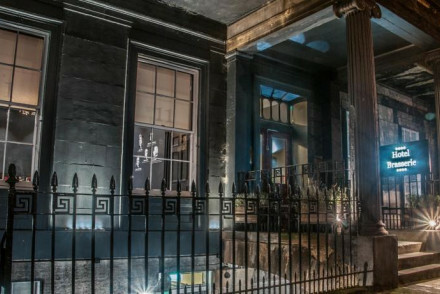 If you’re interested in eating well and shopping well during your Edinburgh stay then Le Monde, a chic 18 bedroom townhouse just off Princes Street is for you, There are three bars and two restaurants too! Prestonfield feels more like a country house hotel than a city central one, but here you’re just five minutes from the Royal Mile - despite being surrounded by 20 acres of spectacular parkland. The dining is fine, the bedrooms divine and nothing is too much trouble. 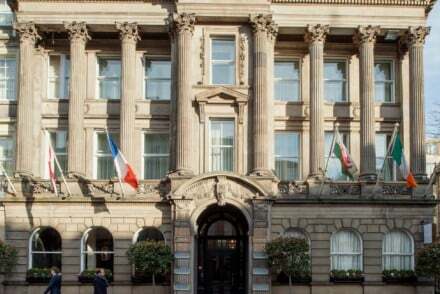 Just ten minutes walk from the castle, the Principal Hotel George Street is a grand and luxurious hotel with 249 rooms in an unbeatable location. Perfect for an indulgent weekend. 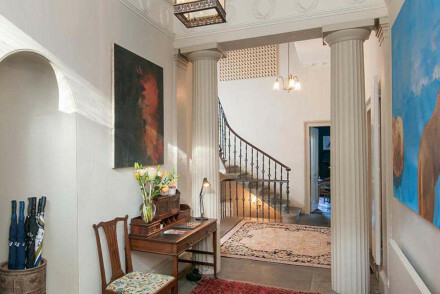 Dunstane Houses is a chic property in a peaceful corner of Edinburgh's West End. Recently renovated it boasts chic rooms and suites (some with in room copper tubs) and an excellent restaurant and whisky bar. 24 Royal Terrace is a home from home for connoisseurs of contemporary art and stylish design. 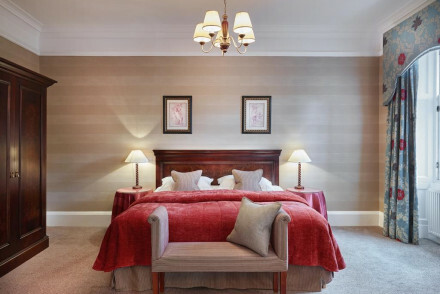 There are just 15 sumptuous rooms plus a popular bar, within 20 minutes of the Royal Mile. The Glasshouse, Edinburgh is a stylish, modern hotel with plenty of glass and large, open spaces filled with natural light. There’s a roof garden dotted with fragrant lavender and amazing views of Carlton Hill. 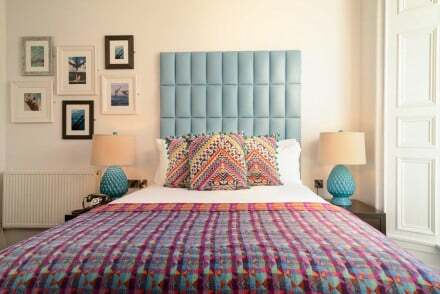 If you’re looking for hip and happening look no further than The Rutland Hotel, a stylish, 12 room hotel on Princes Street. Glitzy and glamorous with a sensual feel, the swanky bar and club might just top off your stay. 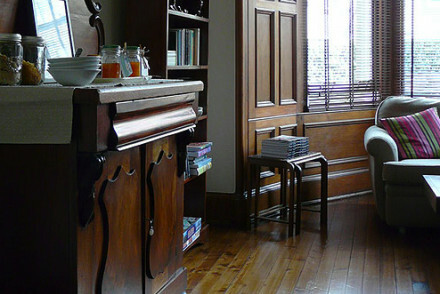 23 Mayfield is an elegant, five star B&B in a beautiful Victorian building. There are seven rooms, some with four poster beds, and all with wood panelling, fireplaces and big bathtubs. They serve an excellent breakfast and there’s a lovely garden. Try 94DR for seven good sized rooms with luxury trappings, plus great views of Arthur's Seat. You’re 10-15 minutes walk from the centre of town, but also on a bus route. Alternatively book into Millers64, a victorian townhouse where the Clelland sisters' focus on attention to detail is evident all over. The Antler Guest House has just two bedrooms, but they’re stylish and contemporary with Persian rugs and original art. You’re in Leith, but only about a 20 minute walk from the castle. 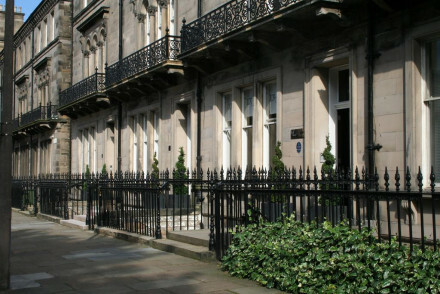 Chester Residence is a cosy collection of 19 rooms and suites on a quiet street in Edinburgh’s West End. They’ve a resident family of soft toys to please their youngest guests. The Atholl is a spectacular, four room hotel in the New Town with beautiful classical contemporary suites and superb service. The bathrooms are by Philippe Stark, the food by Albert Roux trained chefs and nothing is too much trouble. 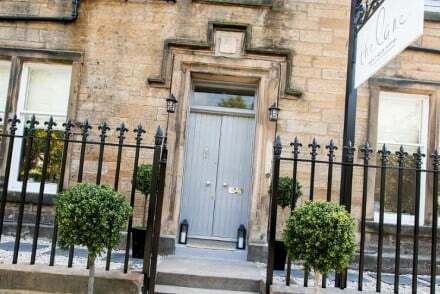 B+B Edinburgh is a roomy B&B in the West End which feels more like a private club or boutique hotel than a B&B. Awash with Victorian character this is an exclusive feeling place without the price tag. Its 27 rooms start from as little as £75 per night including breakfast. Brooks Edinburgh is friendly, clean and tidy and amazing value, with some of its 46 rooms starting from less than £60 per night. And you’re within walking distance of many of the main sights. For those who want a city centre apartment, visit our online partner, booking.com. Edinburgh International Airport has links to over 130 different destinations and is about an hour’s flight from London. However Scot Rail’s Caledonian Sleeper is probably the most romantic way to arrive. You get into Waverley Station, which is also well connected to other UK wide destinations. If you want to hire a car - which we strongly advise if you’re staying in Edinburgh and you want to see the surrounding area - we recommend you visit our online partner, Rentalcars. Edinburgh is busy over August for the Festival and the Fringe, and over Christmas and New year for Hogmanay, but the space in between is quiet and still pleasant weatherise. Alternatively June and July are also popular. Of course if you’re here for the events then book well ahead to avoid disappointment. Still not sure which is the best place to stay in Edinburgh for you? You could refine your search to the 6 Best Hotels in Edinburgh's West End? Or the 10 Best Hotels in Edinburgh's New Town? 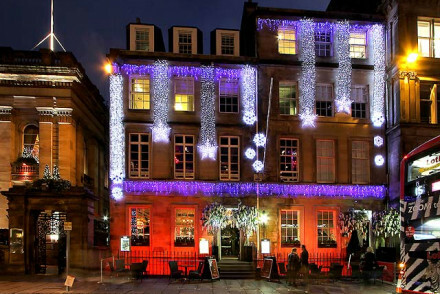 or the 5 Best Hotels in Edinburgh's Old Town? 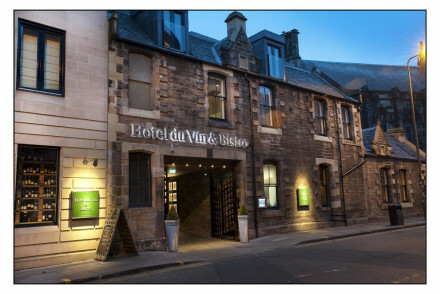 or the 5 Best Hotels on the Royal Mile? 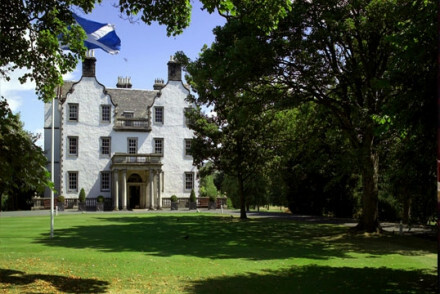 Or perhaps you'll find find something in our Ultimate Guide to the best hotels in Scotland? Or you could contact one of our friendly Gurus for personalised advice. A smart, affordable hotel in the trendy port district of Leith. Once a post office, now only the red door remains as a reminder of its past. Interiors are unfussy and contemporary with bright rooms that are larger than average. The artisanal cafe and easy city centre access are a real draw. Amazingly good value in not quite central Edinburgh. Clean, tidy, comfortable, friendly and for those on a budget a great find. Roomy B&B in Edinburgh's West End. More like a private club or a boutique hotel, awash with Victorian character. Come for the exclusive feel without the exclusive prices and the brilliant central location. 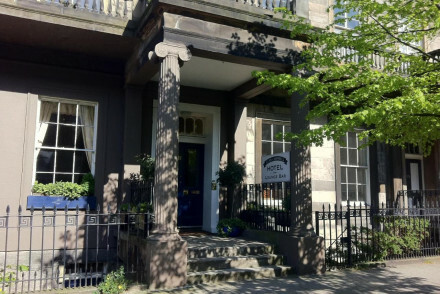 Set in a lovely Victorian former Manse, the Albyn Townhouse is an excellent B&B a little away from Edinburgh city centre. Lovely, comfortable rooms feature ornate beds and sofas that are great for relaxing. A great base from which to explore Edinburgh's old town. Great walks - Go for a lovely walk through the Meadows and up Arthur's Seat. Sights nearby - Go and visit the iconic Edinburgh Castle. 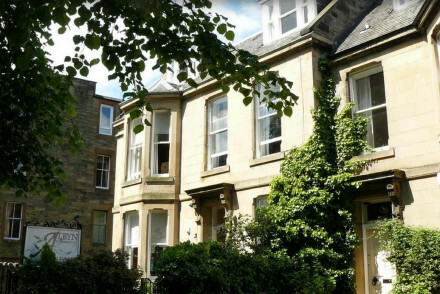 Set in charming Edwardian townhouse, The Hedges is an excellent B&B just a short walk from Edinburgh city centre. Featuring lovely rooms and sleek ensuite bathrooms, it provides a great base for people looking to explore the Scottish capital. Great walks - Taking a stroll through Edinburgh must be one of the most picturesque city walks in the world. Local markets - Wander down to Stockbridge and go to the weekend market. Sights nearby - Walk up the Royal Mile to Edinburgh Castle. 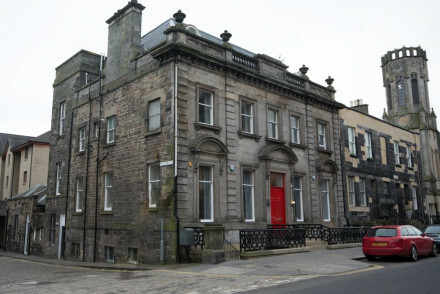 Boutique guest house on southside of Edinburgh, 10-15 mins walk to the centre but on bus route. Good size rooms with luxury trappings and fabulous breakfast. Great views of Arthur's Seat. Friendly, laid back. Elegant Victorian townhouse hotel with an outdoor terrace and a fine dining restaurant. Stylish interiors feature sophisticated furniture and plush fabrics, while sumptuous rooms have a serene palette of creams and tastefully framed pictures. A relaxed west-end base slightly removed from the buzz. A slick hotel providing contemporary accommodation, fine dining and excellent service all at exceptionally good rates. Rooms are grown-up with dark hues, wide-screen TVs and luxury bathrooms. A small gym and executive lounge provide evening entertainment. Ideal for businessmen and travellers alike. Value chic - Find style and luxury all at a very reasonable rate. Sailing - Embark on a scenic wildlife and island cruise on the River Forth. Sights nearby - Visit the nearby historic Hopetoun House. Trendy hotel in former seaman's mission in the heart of Leith. Trademark comfy beds and roll top baths. State of the art gym, restaurant, stylish bar. 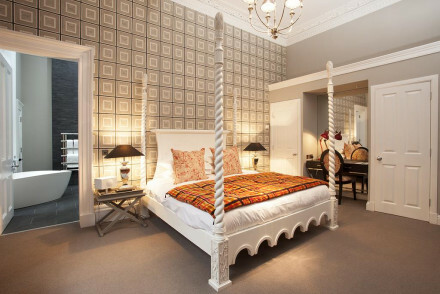 Set in the charming district of Morningside in Edinburgh, The Lane is a delightful boutique hotel. 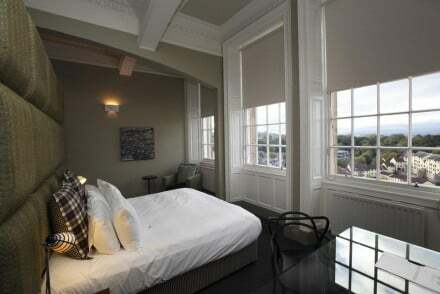 Offering smart rooms and an atmospheric bar/restaurant, it's a great base for a weekend exploring Scotland's capital. Great walks - Climb Edinburgh's iconic Arthur's Seat. Sights nearby - Visit Edinburgh's world famous castle. A comfortable modern guesthouse in Edinburgh's Leith area. Stylish contemporary rooms boasting original artworks, crisp white linens, and Persian rugs. The hotel is within walking distance of the major sights and sounds of the city. Fantastic value for a city break. Local exploring - The ideal base to return to after a weekend of exploring Scotland's capital. 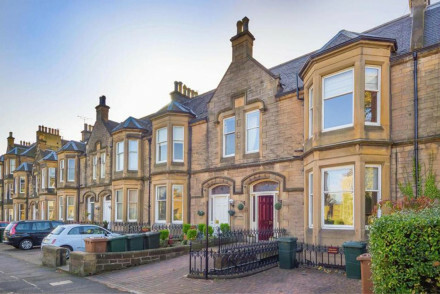 Value chic - A great value option situated in Edinburgh's up and coming Leith district. Sights nearby - Twenty minutes walk from Edinburgh Castle. Boutique B&B in Victorian townhouse in central Edinburgh. Victorian features, oriental minimalism, contemporary open space. Large comfortable rooms. Nira Caledonia is situated within a magnificent row of Georgian townhouses and is a luxurious boutique hotel. Elegantly designed rooms are chic and comfortable with spacious ensuite bathrooms. The superb restaurant serves delicious cuisine that focuses on local and organic produce. Great walks - Go for a lovely walk in the nearby Royal Botanic Garden. Local markets - On Sundays, visit Stockbridge Farmers Market. Sights nearby - Visit the iconic Edinburgh Castle. Paul Kitching's Michelin-starred restaurant with rooms is one of Edinburgh's cosiest cocoons. Staying here is like being a guest at a rather posh house party for a select few. Sights nearby - Ten minutes walk from the Royal Mile and Edinburgh castle. Great walks - Excellent walking around the nearby Carlton Hill. A stylishly renovated Inn offering spectacular views of the coast and the Firth of Forth. Light and airy rooms benefit from large sash windows and are simply dressed with light hues and pops of colour. With a superb restaurant and ideally placed for both the airport and easy access to the city. Local exploring - A chic hotel with lovely views of the bridges and easy access to Edinburgh and it's many attractions. Great walks - Take scenic walks along the coast and through the Dalmeny Estate. Sights nearby - The majestic Edinbrugh Castle is a must visit. A central hotel set in a historic building comprising of exquisitely designed apartments. The decor is undeniably hip, featuring a fresh palette, an array of potted plants and Scandi-cool furniture. An artisanal cafe is the perfect spot to pop into at any time of the day. A real gem. This baronial West End townhouse has a clubby feel. Staying here feels a bit like being a guest in a Scottish laird's city pied-a-terre. Sights nearby - Ten minutes walk from Edinburgh Castle and the Royal Mile. Large townhouse hotel in West End of Edinburgh. Contemporary ambience. Bold colours and rich interiors. Acclaimed restaurant, large individually decorated rooms. Stylish and sleek, No. 11 in Edinburgh's New Town is an exemplary restaurant with rooms. The ten elegantly designed and tastefully furnished, the rooms are spacious and luxurious. 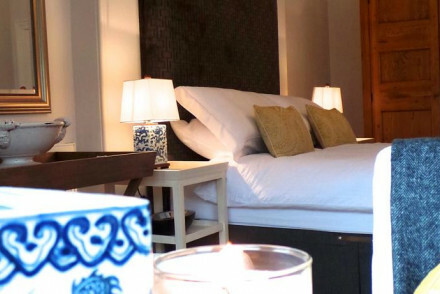 Just a short walk from the heart of Edinburgh, it's perfect for a romantic break in Scotland's capital. Foodies - No 11's Brasserie is award winning. They forage for fungi & herbs and source other ingredients from local artisan suppliers. Sights nearby - Walk up the Royal Mile to the magnificent Edinburgh Castle. Great walks - Go for a walk up Calton Hill. 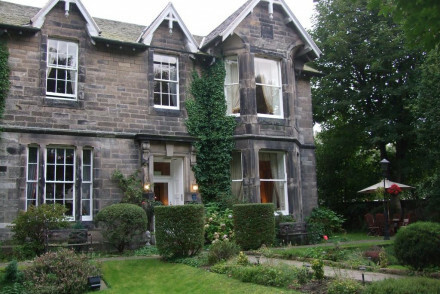 Just a short stroll from Arthur's Seat, Barony House is a delightful B&B. The rooms have magnificent ornate beds that offer a great combination of character and comfort. A superb Edinburgh base for people looking for somewhere quiet away from the hustle and bustle of the centre. Local exploring - A great base for exploring Edinburgh as well as the surrounding area. Great walks - Go for a walk up Arthur's Seat and through Holyrood Park. Sights nearby - Stroll up the Royal Mile to the iconic Edinburgh Castle. Contemporary hotel close to the Royal Mile. Wine cellar, whisky snug, bar and brasserie. Large comfortable rooms. 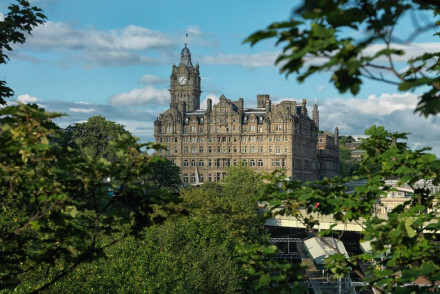 A superb hotel that captures all the splendour of Edinburgh's Edwardian history. The plush rooms are elegantly appointed with tasteful furnishings and charming artwork. 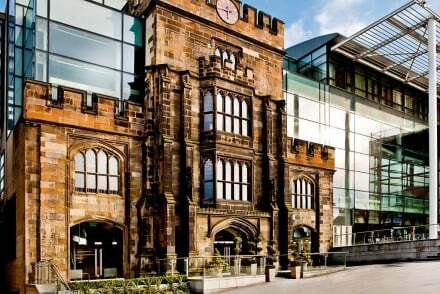 It serves as a great launchpad for exploring Edinburgh's main attractions. A city centre gem. Romantic Break - With luxurious rooms, Egyptian cotton bedlinen, and views over Royal Terrace Gardens- it's perfect for a romantic city break. Local exploring - Just east of the city centre, with easy access to the sights, yet sitting on a peaceful street slightly out of the action. Sights nearby - Fifteen minutes walk from the Royal Mile and Edinburgh Castle. Local markets - In December explore Edinburgh's famous christmas market. 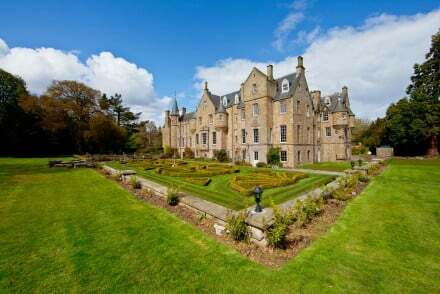 A stunning mansion and estate perfectly positioned just outside Edinburgh. Elegant rooms are spacious and individually styled. Pick a suite and enjoy four posters, chandeliers and open fireplaces. An exemplary bistro and sumptuous private dinners are on offer. A spoiling country escape. Country Escape - A rural escape of grand proportions - an imposing 15th century mansion set in glorious parkland. Sights nearby - Visit the UNESCO World Heritage Site of Edinburgh Castle. 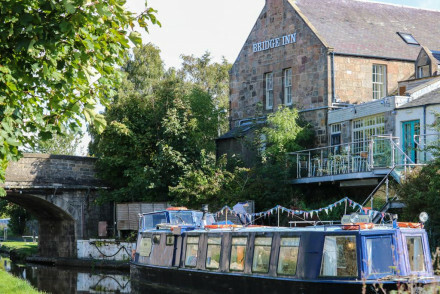 A delightful village Inn set in a picturesque canal side spot in a quiet village just outside Edinburgh. 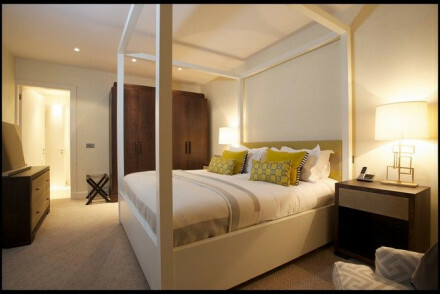 The four rooms are perfectly styled producing an elegant yet cosy feel. The food is what this place is all about with delicious seasonal produce and innovative cooking. Foodies - The award winning gastro pub serves exemplary food using locally sourced produce. Sights nearby - Visit the majestic Edinburgh Castle and admire the city views from atop. Great walks - Take scenic walks along the canal. 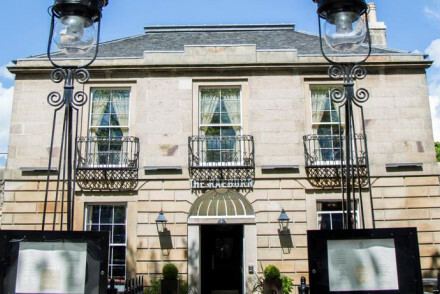 The personification of opulence, The George combines grand luxury with a modern sleekness to create a superb hotel right in the centre of Edinburgh. Its location is unbeatable with all of the city's main attractions a short walk away. Perfect for an indulgent weekend in Edinburgh. Sights nearby - Just ten minute walk from the magnificent Edinburgh Castle. Modern, stylish hotel. Large open spaces filled with natural light. Lavender roof garden with views of Carlton Hill. Patios, verandas, areas for private meetings. 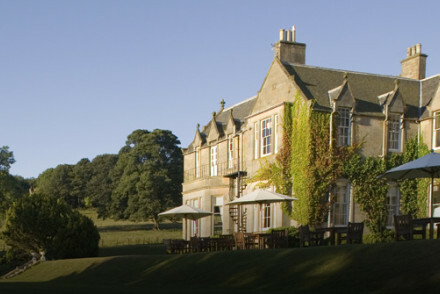 Country house hotel on the outskirts of Edinburgh. Great facilities include spa with large heated pool and a plethora of treatments to choose from. Great food too with 3 AA Rosette fine dining in Ushers Restaurant. Perfect for business travellers - it's only 2 miles from the airport. A charming family-run guesthouse boasting a fantastic central location. Traditionally dressed throughout, expect floral patterns, soft hues and antiques. Breakfasts are not taken lightly with both a continental and Scottish serving which includes haggis. A delightful spot to explore the city from. Local exploring - A charming city base with easy access to the main attractions and hosts with an extensive knowledge of the area. Sights nearby - Take a tour of the Royal Yacht Britannia, a ship that has played host to some of the most famous people in the world. A larger-than-life statue of Sherlock Holmes is your landmark for this ultra-chic boutique property in Edinburgh's buzzy Broughton district. 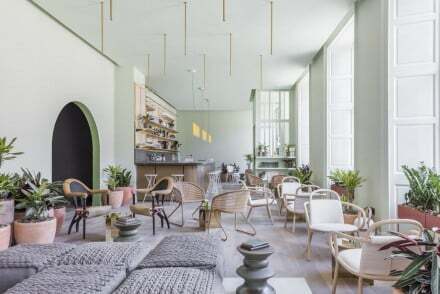 City Style - A chic hotel in a beautiful Georgian townhouse, with a cool contemporary rooms, a trendy cocktail bar and sleek steakhouse. Writing a novel - Draw inspiration from stayng in the very building that the literary giant Sir Arthur Conan Doyle was born in! Great walks - Centrally located, this hotel is perfect for exploring this beautiful and historic city on foot. Tucked away on the fringes of Edinburgh's New Town, 11 Brunswick Street is a serene, grown-up restaurant with rooms in a quiet part of town. Sights nearby - Twenty minutes walk from city centre sights such as Edinburgh Castle and the Scott Monument. Great walks - Take a great walk up Edinburgh's famous Arthur's Seat overlooking the city. 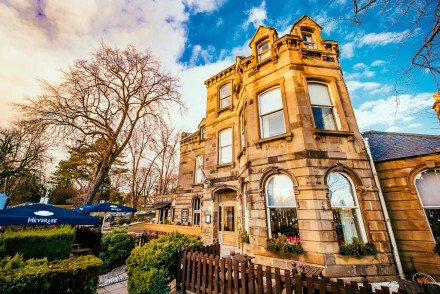 With its cozy restaurant, comfortable rooms and the only outdoor eating drinking space in the area, The Raeburn brings a touch of class to bohemian Stockbridge. Sights nearby - Ten minutes walk from the Edinburgh Botanics. A luxurious hotel located in the heart of the city. Beautifully renovated rooms keep the traditional style yet a splash of contemporary flare has been added. The two restaurants are equally stylish and the bar produces some top-notch cocktails. The service is slick and the positioning perfect. City Style - A centrally located hotel that has perfectly brought a traditional building into the 21st-century. Sights nearby - The majestic Edinburgh Castle and its breathtaking views are a must-see. 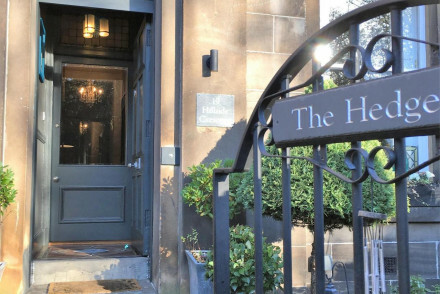 A chic boutique hotel in the leafy neighbourhood of Bruntsfield. 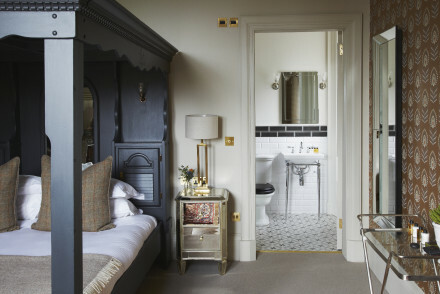 Quirkily designed rooms feature boldly coloured headboards, large sash windows, crisp white linen and luxurious bathrooms. A lively bar serves up superlative cocktails and the restaurant uses local produce to great effect. City Style - A smart boutique hotel who claim (and achieve) "luxury for all, from breakfast ’til bedtime". Sights nearby - A trip to Edinburgh wouldn't be complete without visiting the impressive castle. Great walks - Climb to the top of Holyrood Park known as Arthur's Seat. 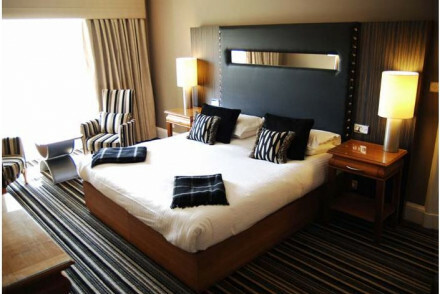 Small and stylish hotel in the most central of locations, Edinburgh's Princes Street. A riot of glitz and glamour that has a sensual feel. Come for the glamourous nightlife - swanky bar and club await. Elegant 5* B&B in Victorian building. Romantic rooms have four poster beds, panelled walls and big bathtubs. Intimate restaurant serving excellent breakfasts. Garden with seating and hot tub. Stained glass and fireplaces throughout. Cozy, historic and quiet. This cosy, sweet scented cocoon on a quiet street in Edinburgh's West End is not just for romantic couples. Just as well suited to couples as it is to families, Chester Residence even has a resident family of soft toys to please its youngest guests. Sights nearby - Ten minutes walk from Edinburgh Castle. 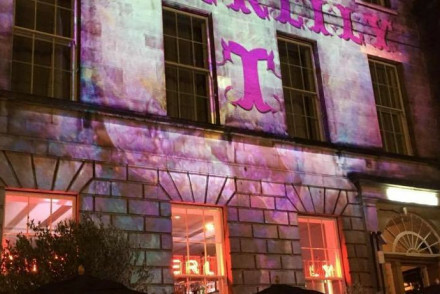 Those looking for a ringside seat for Edinburgh's famed Hogmanay celebrations, or who just like to be in the heart of things at any time, will like the Inn on the Mile. Sights nearby - Within five minutes walk of Edinburgh Castle and St Giles Cathedral. Great walks - Take a walk up the nearby picturesque Arthur's Seat. Landmark - Situated on Edinburgh's historic Royal Mile. Centrally located, 24 Royal Terrace is a home away from home for connoisseurs of contemporary art and stylish design. 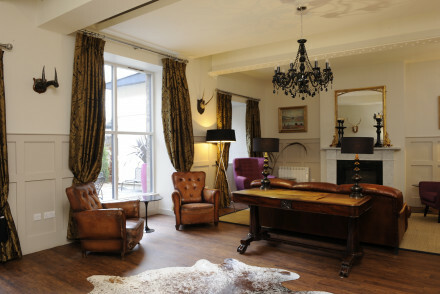 Home to a popular bar, serving carefully chosen single malts this is a top-drawer stay. Sumptuous rooms, decorated in a classic style feature all the mod-cons. A winning stay. Sights nearby - Within twenty minutes walk of Edinburgh Castle and the Royal Mile. This historic hotel overlooking Edinburgh Castle, was formerly the HQ for the Scotsman newspaper. Come for Michelin star restaurant, close promiximty to Princes St and a world-class gym. Chic interiors in traditional rooms. Great walks - Calton Hill, is just a short stroll from the hotel, enjoy 360 views of the city at the city's UNESCO World Heritage Site. Sights nearby - Overlooking Edinburgh Castle. Views - Good city views. 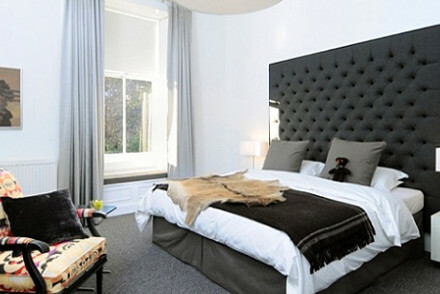 Quietly confident, stylish, sophisticated and efficient.THE place to stay in Edinburgh. Part of Rocco Forte Collection and boasting a Michelin starred restaurant, comprehensive spa and over 150 bedrooms. The old railway hotel transformed into a grande dame. True indulgence. Sights nearby - Visit the nearby Edinburgh Castle and the Scottish National Portrait Gallery. Great walks - Walk to the summit of Calton Hill and enjoy the panoramic views. Views - Wonderful city views towards Arthurs Seat. Chic little hotel on George Street, complete with bar and restaurant downstairs. Stylish, glamourous and modern. Good food, even better cocktails and a lively atmosphere with one of the most central locations. Great for a chic weekend away. City Style - A bold boutique hotel full of glitz and glamour, with an excellent cocktail bar and access to a connecting nightclub. Sights nearby - The impressive Edinburgh castle is in close proximity. 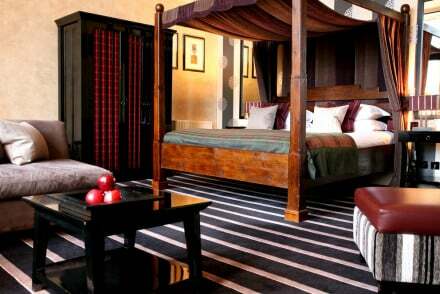 Opulent extravagance at the Prestonfield just 5 mins from the Royal Mile in Edinburgh. Come for attentive service, divine bedrooms and spoiling galore. Fine dining is served in an ultra romantic setting. The concierge have a 'nothing's too much' attitude. Best for a truly indulgent stay. Romantic Break - This hotel oozes glammour, romance and seduction, with its wildly opulent canopied beds, rich fabrics and roaring fires. Local exploring - The best of both worlds- set in 20 acres of spectacular parklands, yet within spitting distance of Edinburgh. Great walks - Don't forget your welly boots, there are 20 acres of parkland to explore. A chic townhouse with 18 bedrooms just 100m from Prince's Street. 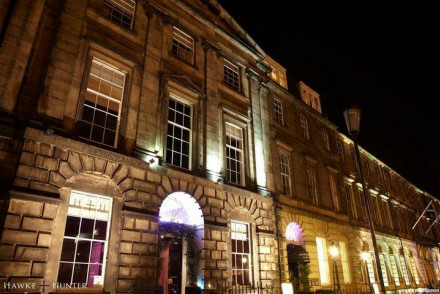 Central hotel in the heart of Edinburgh offering modern rooms, three bars and two restaurants. A suitable choice for guests interested in fine restaurants and designer shopping. A retired lighthouse tender, now turned luxury hotel, anchored in the hip area of Leith. Cabins range from classic doubles to decadent suites. The design is luxurious with brass fittings, leather, and rich hues. A glamorous ballroom is ideal for a party and there's a fabulous little restaurant too. 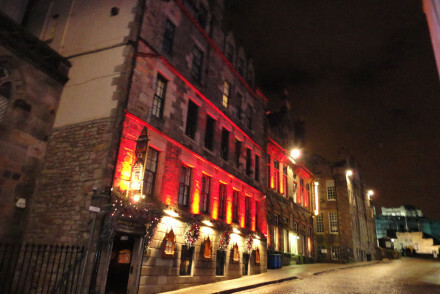 Superbly located at the gates of the Castle, on the Royal Mile, sits this intimate, Gothic hotel. The rooms are luxurious, romantic & eccentric – think candlelit, wood paneling and plenty of velvet. Enjoy delicious Scottish food in the equally atmospheric restaurant. Foodies - Serving Scottish beef, lamb, game, the Witchery's famous steak tartare, briny-fresh seafood platters and even some haggis. Spectacular hotel In Edinburgh's Georgian New Town, with just four magnificent classical and contemporary suites. Expect the very best with superb service, exceptional food from Albert Roux trained and supervised chefs. Balthaup Kitchens, Philippe Starck bathrooms. Your wish is the Atholl's command. Private chef / butler - Private chefs produce gourmet cuisine in your suite's kithchen.